With years of experience so in installing, maintenance, and engineering of IT solutions and network security, we know first hand the most important aspects of manufacturing and implementing superior hardware and software. This is because we have taken the time to develop the best technology and to refine best practices for every detail related to the installation of our products and delivery or our services. 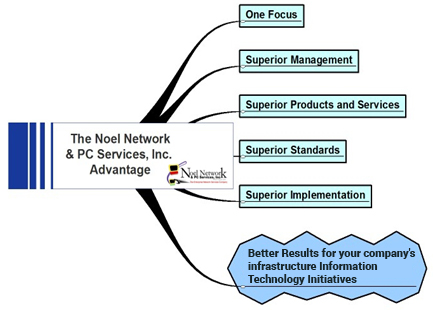 You will be able to observe these best practices rigidly enforced anytime you interact with Noel Network & PC Services, Inc. We make the difference through better technology, better leadership, better support services, and our single-minded focus. Of course, our capabilities come only through experience, knowledge, forethought, practice, and discipline. The highlighted areas of this section further illustrate the ways in which we differentiate and characterize our organization’s professional approach to our mission. It is designed to provide insight into factors that will ensure we deliver a better solution to your business as part of this initiative. First and foremost, our mission is your mission; of course, this means ensuring that our organization is postured and able to meet your expectations at all times. While there are many very good business reasons for implementing our technology, we clearly understand that your company’s project will only succeed when we’ve enabled the key technologies you seek. Further to that end, we understand that in order to ultimately succeed, our solutions must be fully supportable, operate reliably, and reduce overhead in order to maintain interoperability. We understand data retrieval and reliable interoperability are your top concerns. To that end, we understand that controlling the delivery of the experiences your company receives while improving performance and reducing technology and our approach to implementation and management are more likely to deliver what you expect than our competitors will. We will place a highly professional and mission-oriented implementation and project management team at your disposal. They will work with your team directly with a spirit for collaborative success. They will provide both guidance and hands on assistance wherever necessary. As a result, together, we will deliver the solution that you demand with the highest degree of precision. At Noel Network & PC Services, Inc., we hold ourselves to a higher standard, and as such, you should always expect that standard to be met. We promise to be vigilant as an organization in the performance and attainment of objectives you rely on us to accomplish. Our knowledge, leadership, mission-oriented focus, and high standards come directly from our management team. 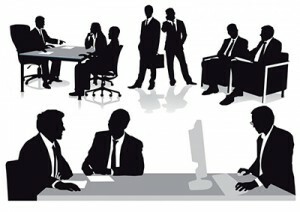 At Noel Network & PC Services, Inc., management also is an active and continually rehearsed function. In order to be most effective, our management team actively practices the standard of “Leadership by Setting the Example.” We are proud of the results of our diligent development efforts in this area. As such, we consider our management team’s effectiveness to be another one of our key differentiators. Our Management Team promises to be, first and foremost, alert and aware at all times to your needs and to effect solutions to meet your requirements most effectively and expeditiously. They further promise to ensure that our commitment to your mission, and more importantly, the bottom line results that we promise are delivered. They willingly accept ultimate responsibility to your company for the success of this initiative. They will answer any and all requests with facts, candid analysis, and focused recommendations on-demand. As a leading IT solutions and network security provider, we understand the needs of our customers, we believe, better than any other organization. To that end, we have a solid record of demonstrated successes. In terms of IT implementation and maintenance, our systems enjoy significantly higher success and sustainability rates. Our products and services are more capable, deliver higher quality results in all respects, and most importantly, our solutions are fully standardized for application within the broadest range of IT Solutions and Network Security – We’re highly adaptable. Our philosophy has been, and we can assure you, will always be, to design our solutions around technology based on proven technologies and the soundest business operation principles. Successfully providing IT solutions and network security to small and medium business like yours is about technology fundamentals and practices that ensure those fundamentals are rigidly followed. One of the most important responsibilities that we have is to ensure that our technology is always operational, supportable, and sustainable over the course of its implementation and usage. To attain these objectives, we’ve taken the time to develop and refine best practices for every detail related to the delivery of our products and services. As such, we ensure that a process or standard guides every aspect of our development, implementation, and business operations. You will never interact with Noel Network & PC Services, and have someone sit around wondering what needs to be done, or whom you need to talk to next, or what action to take immediately. All of our key differentiators will be combined to deliver the best possible benefits for your company. Our management, professionalism, ability to communicate, and our procedures help us to proactively spot problems and then make them go away quickly. The superior implementation of business practices governing operations, software and hardware design, implementation, and the maintenance of large-scale IT solutions and network security is our only business. As such, you can trust us to be a highly responsive business partner and to deliver the better, higher quality solutions that your organization, your company, will depend on daily. The result is a better experience for everyone involved in the projects we lead.